This security poster illustrates the TM-46 & TMN-46 Russian Anti-Tank Mines. The TM-46 design was heavily influenced by WW2 German anti-tank mines. The TMN version is the modernised version fitted with an anti-lift fuze well on the underside. These mines can be fitted with a variety of fuzes, including a tilt rod type. This security poster features the TM-46 & TMN-46 Russian anti-tank mines’s fuzes and technical specifications, illustrations and descriptions on how to disarm the mine, a sectioned TMN-46 with MVM fuze and an MUV in the anti-handling fuze well, and a TM-46 with the MVSh-46 fuze. The security poster also shows illustrations of the Russian Anti-Tank Mine development 1936-1946, a sectioned MVSh-46 fuze, and a sectioned MV-5 fuze. A sectioned TMN-46 with MVM fuze and an MUV in the anti-handling fuze well. A TM-46 with the MVSh-46 fuze. Illustrations of the Russian Anti-Tank Mine development 1936-1946. Illustrations and descriptions on how to disarm the mine. The TM-46 & TMN-46 Russian anti-tank mines’s fuzes and technical specifications. 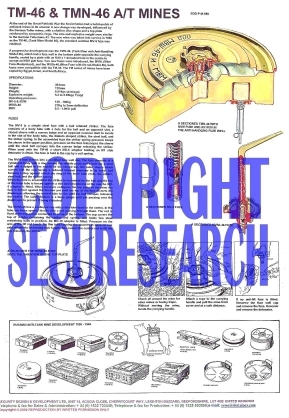 This security poster features the mines's fuzes and technical specifications, illustrations and descriptions on how to disarm the mine, a sectioned TMN-46, a TM-46, illustrations of the Russian Anti-Tank Mine development 1936-1946, a sectioned MVSh-46 fuze, and a sectioned MV-5 fuze.